Chicago Prime is a major manufacturing world for the Galactic Confederation. But now the robots have rebelled, and in one factory, they're holding hostages. Add an envoy from an AI civilization seeking allies, and a disabled space fleet in a decaying orbit, and you've got adventure! 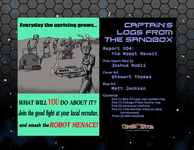 This Captain's Logs from the Sandbox includes star system information on the New Chicago system, a map of the Aldebaran Industries factory, information on five characters, starship and ground-based crew hazard tables, and data on three new pieces of equipment.